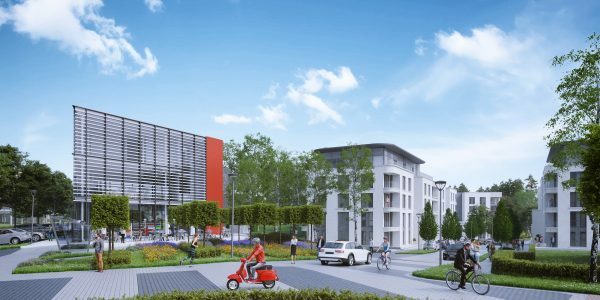 Runnymede Council’s Planning Committee has approved reserved matters applications for the Discovery Building at the heart of the site, offices and 78 more homes at Longcross North. This marks the next chapter in the visionary project that will establish a thriving new Garden Village for Surrey, with opportunities to live and work within one uniquely integrated community. Halogen has been involved in the Longcross site for 10 years, with outline planning permission for homes and offices on the Longcross North granted in 2013. Since then there has been considerable progress on the site, with the delivery of 108 homes. On behalf of Crest Nicholson and Aviva, last year Halogen consulted with the local community on Longcross South, which will comprise 1,320 homes, a primary school and community facilities. Halogen continues to work with residents and stakeholders as further applications for Longcross Garden Village come forward.